I’ve shared several surveys that people can take to determine whether they are libertarian. I invite everyone to participate by clicking here, especially since filling out the survey gives you a $100 discount when registering for this year’s FreedomFest (to be held in mid-July). 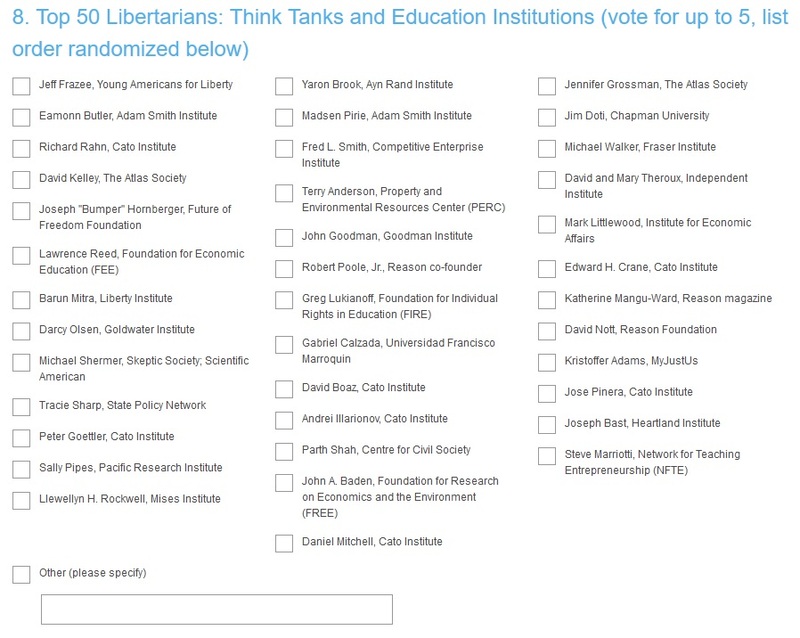 Having worked in libertarian circles for many decades, I’m going to look at each of the categories and take a guess on who will get the most votes and also give my two cents on which of the people are the most under-appreciated. We’ll start with libertarian authors. I’m guessing P.J. O’Rourke will get first place in this category, though Robert Higgs and Charles Murray also are possibilities. The most under-appreciated choice is James Bovard. I’ve known Jim for decades and his writing is both principled and entertaining. I’ve shared several of his columns if you want to get a taste. Now let’s move the business and finance category. I actually know only about half of the people on this list, so take my views here with a grain of salt. For my guess on who will win, I’m torn between listing David Koch and Charles Koch, who have done so much to build libertarian institutions, and Steve Forbes, who has done so much to popularize free markets. For the most under-appreciated libertarian, I’m going with John Aglialoro. How can you not applaud a guy who finally delivered a movie version of Atlas Shrugged? Now let’s look at libertarian celebrities. I have no idea who will win this category. I’m wondering if voters will pick the biggest celebrity, meaning perhaps Clint Eastwood. It’s also hard to pick the most under-appreciated libertarian in this category. But I’ll go with Penn Jillette. I’ve seen his Las Vegas show (Penn and Teller) two times and I imagine hundreds of thousands, if not millions, of Americans have been both entertained and enlightened by the experience. By the way, I wonder why Howard Stern wasn’t listed. Time now for the top libertarian in freedom organizations. This is another hard-to-guess category. 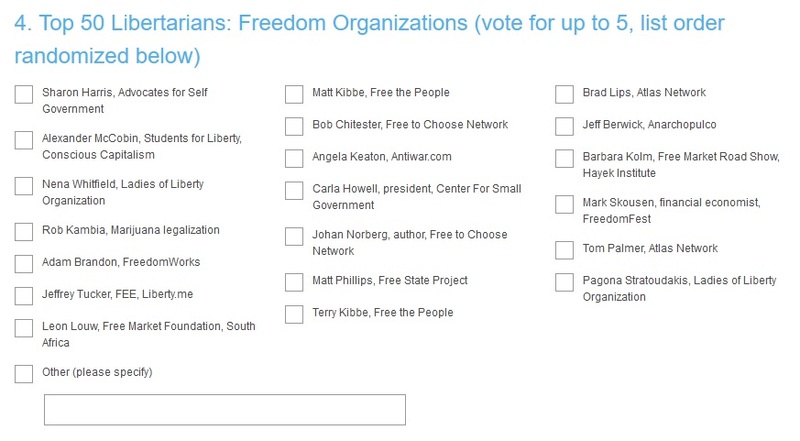 If I’m basing my choice on (deserved) celebrity status, I would have to pick between Mark Skousen, who has made FreedomFest a must-attend event, Jeffrey Tucker, the guy who is dramatically expanding FEE’s outreach, and Johan Norberg, who is famous for his short videos on freedom. For under-appreciated libertarians, Tom Palmer deserves praise as one of the most determined and effective libertarians ever to traverse the globe (literally and figuratively). And Barbara Kolm deserves some sort of prize for her yeomanlike (yeowomanlike?) efforts to save Europe with her annual Free Market Road Show. Let’s shift to the media category. 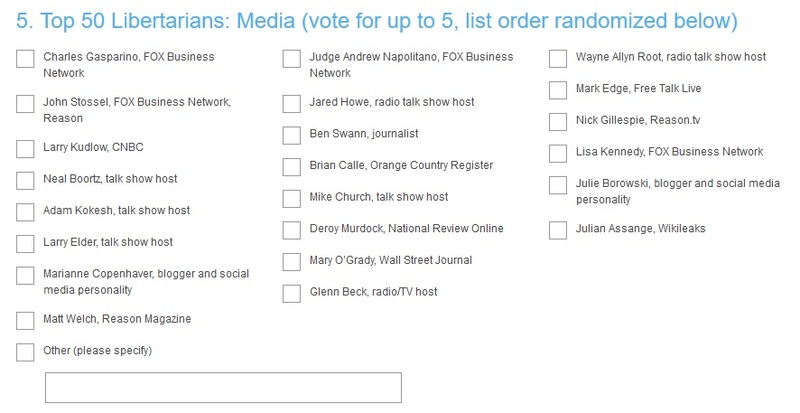 I would be stunned if John Stossel didn’t win this category, though Judge Napolitano and the guys from Reason may give him a tough race. My choice for under-appreciated libertarian would be Neal Boortz or Julie Borowski. The big oversight is that Glenn Reynolds of Instapundit isn’t listed. Here are the choices for politics. I assume there’s not much suspense on who will win. If Ron Paul doesn’t come in first place, I’ll eat my hat. Actually, I retract that offer. Based on my less-than-impressive election predictions, I no longer feel confident about my ability to prognosticate. But I still think Ron Paul wins, perhaps followed by his son. For under-appreciated libertarians, I’m going with Justin Amash and Thomas Massie. It is very helpful to have a couple of solid libertarians in the House of Reprehensibles. They probably should have included Congressman Brat as well. 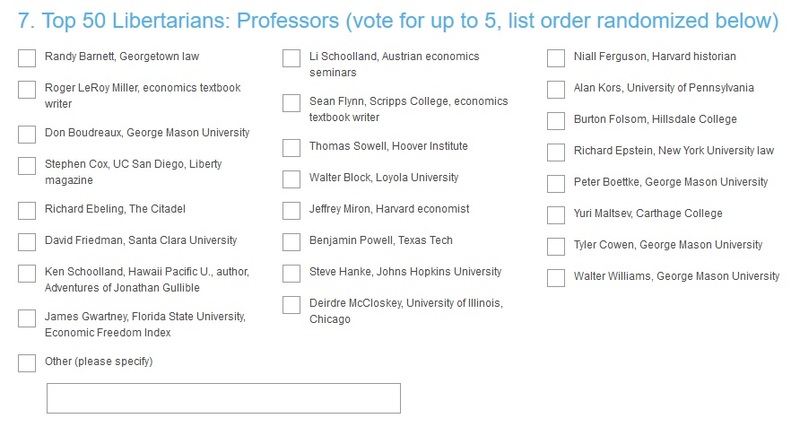 Here’s another very difficult category, the top libertarian professors. It’s impossible to make good selections since there are so many good choices. If you put a gun to my head, I wouldn’t be surprised to see Walter Williams or Thomas Sowell emerge in first place because they’ve both done such a great job over the decades with their books and columns. It’s also difficult to pick the most under-appreciated libertarian. The crowd from George Mason University is superb, Richard Epstein and Randy Barnett are amazing legal minds, and the Schoollands do great work. But I suppose I’ll go with either James Gwartney, since his work on Economic Freedom of the World is so valuable, or Deirdre McCloskey, who deserves praise for her books and other works. By the way, it’s a terrible oversight that Robert Murphy and Ed Stringham are not on the list. Last but not least, we have the think tank crowd. It goes without saying that the Cato Institute (America’s most principled and effective think tank) should win this category. And you have lots of Cato people from which to choose, so pretend you’re a dead person in Chicago and vote early and vote often. 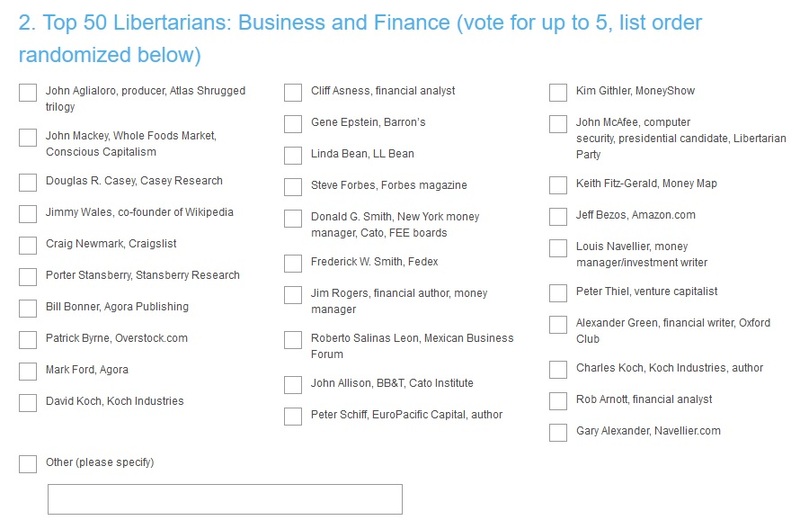 For the most under-appreciated libertarian, I’m going to pick someone who isn’t even on the list. Veronique de Rugy of the Mercatus Center deserves lots of write-in votes. Not only did she escape France, but she’s been one of the most effective and determined policy economists in Washington. If you need any extra convincing, just watch this video. Once again, here’s the link for those who want to take the survey. P.S. On another issue, Paul Krugman once again has attacked me for my comments about California. For those interested, here is my response. Mirror, Mirror, on the Wall, Which Nation Punishes Productive People Worst of All? Back in 2014, I shared some data from the Tax Foundation that measured the degree to which various developed nations punished high-income earners. This measure of relative “progressivity” focused on personal income taxes. And that’s important because that levy often is the most onerous for highly productive residents of a nation. But there are other taxes that also create a gap between what such taxpayers earn and produce and what they ultimately are able to consume and enjoy. What about the effects of payroll taxes? Of consumption taxes and other levies? To answer that question, we have a very useful study from the European Policy Information Center on this topic. Authored by Alexander Fritz Englund and Jacob Lundberg, it looks at the total marginal tax rate on each nation’s most productive taxpayers. They start with some sensible observations about why marginal tax rates matter, basically echoing what I wrote after last year’s Super Bowl. Here’s what Englund and Lundberg wrote. The marginal tax rate is the proportion of tax paid on the last euro earned. It is the relevant tax rate when deciding whether to work a few extra hours or accept a promotion, for example. As most income tax systems are progressive, the marginal tax rate on top incomes is usually also the highest marginal tax rate. It is an indicator of how progressive and distortionary the income tax is. They then explain why they include payroll taxes in their calculations. The income tax alone does not provide a complete picture of how the tax system affects incentives to work and earn income. Many countries require employers and/or employees to pay social contributions. It is not uncommon for the associated benefits to be capped while the contribution itself is uncapped, meaning it is a de facto tax for high-income earners. Even those social contributions that are legally paid by the employer will in the end be paid by the employee as the employer should be expected to shift the burden of the tax through lower gross wages. Englund and Lunberg are correct. A payroll tax (sometimes called a “social insurance” levy) will be just as destructive as a regular income tax if workers aren’t “earning” some sort of additional benefit. And they’re also right when they point out that payroll taxes “paid” by employers actually are borne by workers. They then explain why they include a measure of consumption taxation. One must also take value-added taxes and other consumption taxes into account. Consumption taxes reduce the purchasing power of wage-earners and thus affect the return to working. In principle, it does not matter whether taxation takes place when income is earned or when it is consumed, as the ultimate purpose of work is consumption. Once again, the authors are spot on. Taxes undermine incentives to be productive by driving a wedge between pre-tax income and post-tax consumption, so you have to look at levies that grab your income as it is earned as well as levies that grab your income as it is spent. And when you begin to add everything together, you get the most accurate measure of government greed. Taking all these taxes into account, one can compute the effective marginal tax rate. This shows how many cents the government receives for every euro of additional employee compensation paid by the firm. …If the top effective tax rate is 75 percent, as in Sweden, a person who contributes 100 additional euros to the economy will only be allowed to keep 25 euros while 75 euros are appropriated by the government. The tax system thus drives a wedge between the social and private return to work. …High marginal tax rates disconnect the private and social returns to economic activity and thereby the invisible hand ceases to function. For this reason, taxation causes distortions and is costly to society. High marginal tax rates make it less worthwhile to supply labour on the formal labour market and more worthwhile to spend time on household work, black market activities and tax avoidance. Here’s their data for various developed nation. Keep in mind that these are the taxes that impact each nation’s most productive taxpayers. So that includes top income tax rates, both for the central governments and sub-national governments, as well as surtaxes. It includes various social insurance levies, to the extent such taxes apply to all income. And it includes a measure of estimated consumption taxation. And here’s the ranking of all the nations. Shed a tear for entrepreneurs in Sweden, Belgium, and Portugal. 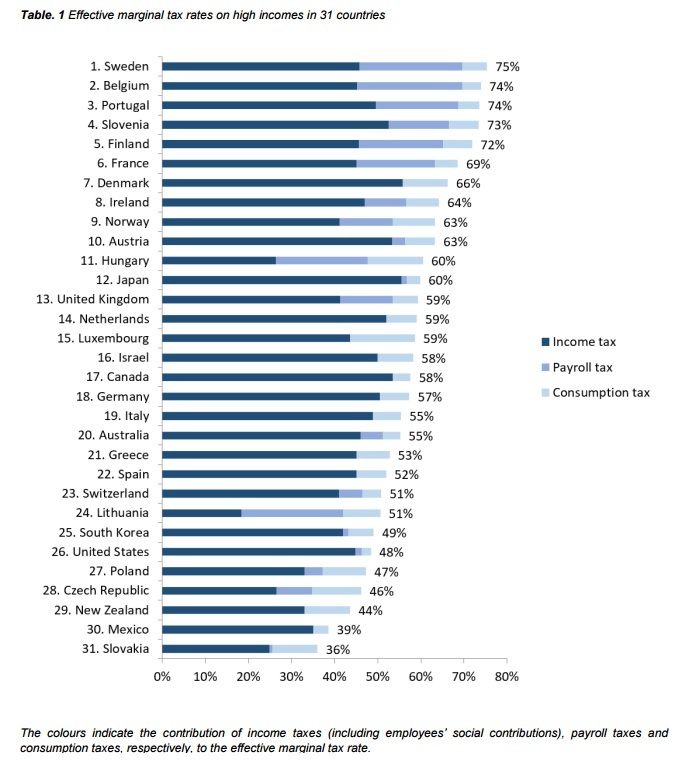 Slovakia wins the prize for the least-punitive tax regime, though it’s worth noting that Hong Kong easily would have the best system if it was included in the ranking. For what it’s worth, the United States does fairly well compared to other nations. This is not because our personal income tax is reasonable (see dark blue bars), but rather because Barack Obama and Hillary Clinton were unsuccessful in their efforts to bust the “wage base cap” and apply the Social Security payroll tax on all income. We also thankfully don’t have a value-added tax. These factors explain why our medium-blue and light-blue bars are the smallest. By the way, this doesn’t mean we have a friendly system for upper-income taxpayers in America. They lose almost half of every dollar they generate for the economy. And whether one is looking at Tax Foundation numbers, Congressional Budget Office calculations, information from the New York Times, or data from the IRS, rich people in the United States are paying a hugely disproportionate share of the tax burden. Though none of this satisfies the statists. They actually would like us to think that letting well-to-do taxpayers keep any of their money is akin to a handout. Now would be an appropriate time to remind everyone that imposing high tax rates doesn’t necessarily mean collecting high tax revenues. In the 1980s, for instance, upper-income taxpayers paid far more revenue to the government when Reagan lowered the top income tax rate from 70 percent to 28 percent. Also keep in mind that these calculations don’t measure the tax bias against saving and investment, so the tax burden on some upper-income taxpayers may be higher or lower depending on the degree to which countries penalize capital formation. P.S. If one includes the perverse incentive effects of various redistribution programs, the very highest marginal tax rates (at least when measuring implicit rates) sometimes apply to a nation’s poor people. P.P.S. Our statist friends sometimes justify punitive taxes as a way of using coercion to produce more equality, but the net effect of such policies is weaker growth and that means it is more difficult for lower-income and middle-income people to climb the economic ladder. In other words, unfettered markets are the best way to get social mobility. 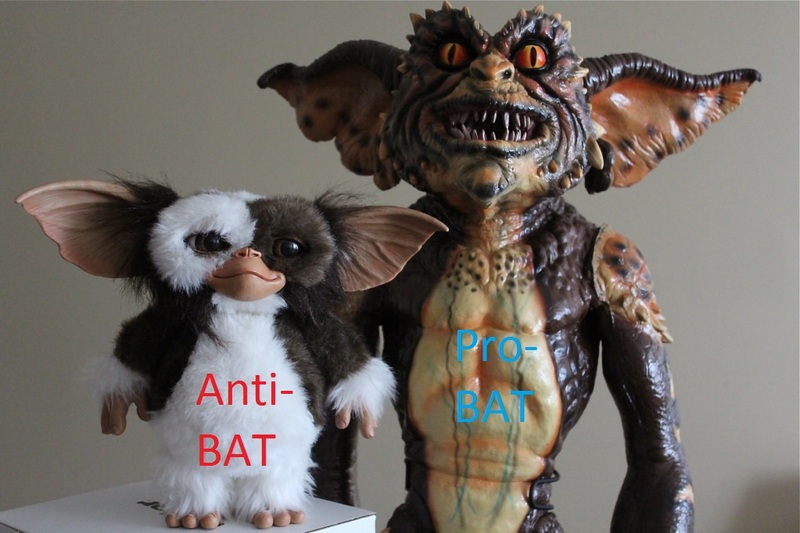 All forms of statism are despicable because they’re morally and practically evil. They’re morally evil since they’re based on coercion. And they’re practically evil since they deliver such awful results for ordinary people. The good news is that some forms of statism are widely discredited. Outside of universities, you don’t find many people who defend and advocate communism. And other than a few lonely cranks, you don’t find many people who defend and advocate national socialism and other forms of fascism. But for some inexplicable reason, you still find some folks who harbor positive feelings about socialism. To be sure, that opens up a bunch of questions, such as whether they even understand that socialism – at least in theory – involves government ownership and operation of the means of production. Such as the United Kingdom in the post-WWII era. For what it’s worth, the fans of Bernie Sanders probably don’t understand anything about economics (goes without saying, right?) 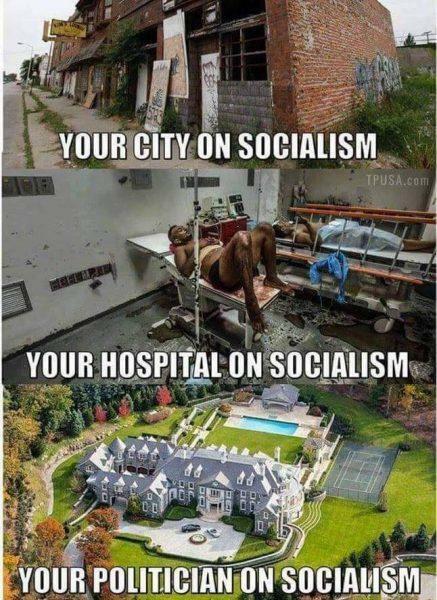 and they probably think that socialism is simply a system with lots of redistribution. Such as modern Denmark (even though that nation is just as market-oriented as the United States). I’m not sure how we educate these people, and I doubt these three photos will have much impact on them, but I chuckled when this showed up in my inbox. I guess the top photo might be Detroit. The second photo could be Cuba. And the last photo might be where Al Gore lives. If that’s the case, the first is actually an image showing the destructive impact of the welfare state and the third is actually an image the benefits of insider cronyism, but let’s not get hung up on details. The real point is that corrupt insiders are the only real beneficiaries of big government. P.S. Two of the most popular columns I’ve produced involve semi-amusing stories that highlight the failure of socialism, redistributionism, and collectivism. “The Tax System Explained in Beer” and “Does Socialism Work? A Classroom Experiment” succinctly capture why it’s very shortsighted and misguided to have an economic system that punishes success and rewards sloth. P.P.S. Yes, socialism breeds misery, but it also generates some clever humor. See here, here, here, here, here, and here. P.P.P.S. And even though self-proclaimed socialists pontificate about sharing and compassion, their ideology actually promotes a bad kind of selfishness. In any event, we’re soon going to get a very strong sign about whether Trump was serious. With Republicans on Capitol Hill divided on how to deal with this cronyist institution, Trump basically has the tie-breaking vote on the issue. In other words, he has the power to shut down this geyser of corporate welfare. But will he? According the Susan Ferrechio of the Washington Examiner, Trump may choose to wallow in the swamp rather than drain it. President Trump now may be in favor of the Export-Import Bank, according to Republican lawmakers who met with him privately Thursday, even though Trump once condemned the bank as corporate welfare. Veronique de Rugy of the Mercatus Center is one on the Ex-Im Bank’s most tenacious opponents, and she’s very worried. …if the reports are true that Trump has decided to support the restoration of the crony Export-Import Bank’s full lending authority, it would be akin to the president deciding to instead happily bathe in the swamp and gargle the muck. …If true, the news is only “great” for Boeing, GE, and the other major recipients of Ex-Im’s corporate welfare. It is also at odds with his campaign promises since much of the way the program works is that it gives cheap loans — backed by Americans all over the country — to foreign companies in China, Russia, Saudi Arabia, and the UAE. Restoring Ex-Im’s full lending-authority powers is renewing the policy to give cheap loans backed by workers in the Rust Belt to companies like Ryanair ($4 billion in guarantee loans over ten years) and Emirates Airlines ($3.9 billion over ten years) so they can have a large competitive advantage over U.S. domestic airlines like Delta and United. It continued to subsidize the large and prosperous state-owned Mexican oil company PEMEX ($9.7 billion over ten years). Seriously? That’s president Trump’s vision of draining the swamp? Ugh. It will be very disappointing if Trump chooses corporate welfare over taxpayers. What presumably matters most, though, is whether a bad decision on the Ex-Im Bank is a deviation or a harbinger of four years of cronyism. In other words, when the dust settles, will the net effect of Trump’s policies be a bigger swamp or smaller swamp? The New York Times opined that Trump is basically replacing one set of insiders with another set of insiders, which implies a bigger swamp. Mr. Trump may be out to challenge one establishment — the liberal elite — but he is installing one of his own, filled with tycoons, Wall Street heavyweights, cronies and a new rank of shadowy wealthy “advisers” unaccountable to anyone but him. …Take first the Goldman Sachs crowd. The Trump campaign lambasted global financiers, led by Goldman, as having “robbed our working class,” but here come two of the alleged miscreants: Gary Cohn, Goldman’s president, named to lead the National Economic Council, and Steven Mnuchin, named as Treasury secretary. …Standing in the rain during Mr. Trump’s inaugural speech, farmers and factory workers, truckers, nurses and housekeepers greeted his anti-establishment words by cheering “Drain the Swamp!” even as the new president was standing knee-deep in a swamp of his own. I’m skeptical of Trump, and I’m waiting to see whether Gary Cohn and Steven Mnuchin will be friends for taxpayers, so I’m far from a cheerleader for the current administration. But I also think the New York Times is jumping the gun. Maybe Trump will be a swamp-wallowing cronyist, but we don’t yet have enough evidence (though a bad decision on Ex-Im certainly would be a very bad omen). Here’s another potential indicator of what may happen to the swamp under Trump’s reign. Bloomberg reports that two former Trump campaign officials, Corey Lewandowski and Barry Bennett have cashed in by setting up a lobbying firm to take advantage of their connections. This rubs me the wrong way. I don’t want lobbyists to get rich. But, to be fair, not all lobbying is bad. Many industries hire “representation” because they want to protect themselves from taxes and regulation. And they have a constitutional right to “petition” the government and contribute money, so I definitely don’t want to criminalize lobbying. But as I’ve said over and over again, I’d like a much smaller government so that interest groups don’t have an incentive to do either the right kind of lobbying (self-protection) or the wrong kind of lobbying (seeking to obtain unearned wealth via the coercive power of government). Here’s one final story about the oleaginous nature of Washington. Wells Fargo is giving a big payout to Elaine Chao, the new Secretary of Transportation. Chao, who joined Wells Fargo as a board member in 2011, has collected deferred stock options — a compensation perk generally designed as a long-term retention strategy — that she would not be able to cash out if she left the firm to work for a competitor. Her financial disclosure notes that she will receive a “cash payout for my deferred stock compensation” upon confirmation as Secretary of Transportation. The document discloses that the payments will continue throughout her time in government, if she is confirmed. The payouts will begin in July 2017 and continue yearly through 2021. But Wells Fargo, like several banks and defense contractors, provides a special clause in its standard executive employment contract that offers flexibility for awarding compensation if executives leave the bank to enter “government service.” Such clauses, critics say, are structured to incentivize the so-called “reverse revolving door” of private sector officials burrowing into government. …Golden parachutes for executives leaving firms to enter government dogged several Obama administration officials. Jack Lew, upon leaving Citigroup to join the Obama administration in 2009, was given a cash payout as part of his incentive and retention awards that wouldn’t have been paid if he had left the firm to join a competitor or under ordinary circumstances. But Lew’s Citigroup contract stipulated that there was an exception for leaving to work in a “full time high level position with the U.S. government or regulatory body.” Goldman Sachs, Morgan Stanley, and Northrop Grumman are among the other firms that have offered special financial rewards to executives who leave to enter government. This rubs me the wrong way, just as it rubbed me the wrong way when one of Obama’s cabinet appointees got a similar payout. But the more I think about it, the real question isn’t whether government officials get to keep stock options and other forms of deferred compensation when they jump to government. What bothers me much more is why companies feel that it’s in their interest to hire people closely connected to government. What value did Jacob Lew bring to Citigroup? What value did Chao bring to Wells Fargo? I suspect that the answer has a lot to do with financial institutions wanting people who can can pick up the phone and extract favors and information from senior officials in government. For what it’s worth, I’m not a fan of Lew because he pushed for statism while at Treasury. By contrast, I am a fan of Chao because she was one of the few bright spots during the generally statist Bush years. But I don’t want a system where private companies feel like they should hire either one of them simply because they have connections in Washington. I hope that Trump will change this perverse set of incentives by “draining the swamp.” But unless he reduces the size and scope of government, the problem will get worse rather than better. Back in 2009, I shared the results of a very helpful study by Pierre Bessard of Switzerland’s Liberal Institute (by the way, “liberal” in Europe means pro-market or “classical liberal“). 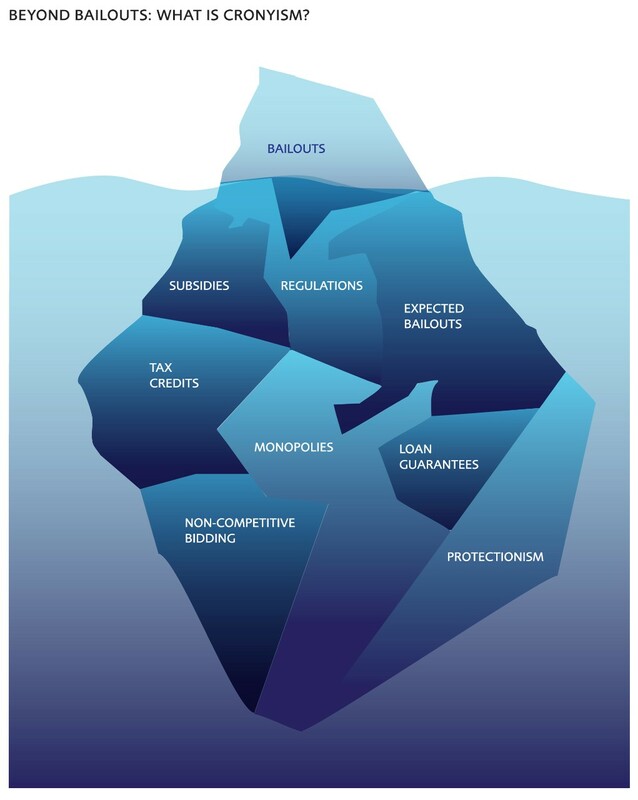 Pierre ranked the then-30 member nations of the Organization for Economic Cooperation and Development based on their tax burdens, their quality of governance, and their protection of financial privacy. Switzerland was the top-ranked nation, followed by Luxembourg, Austria, and Canada. Italy and Turkey were tied for last place, followed by Poland, Mexico, and Germany. The United States, I’m ashamed to say, was in the bottom half. 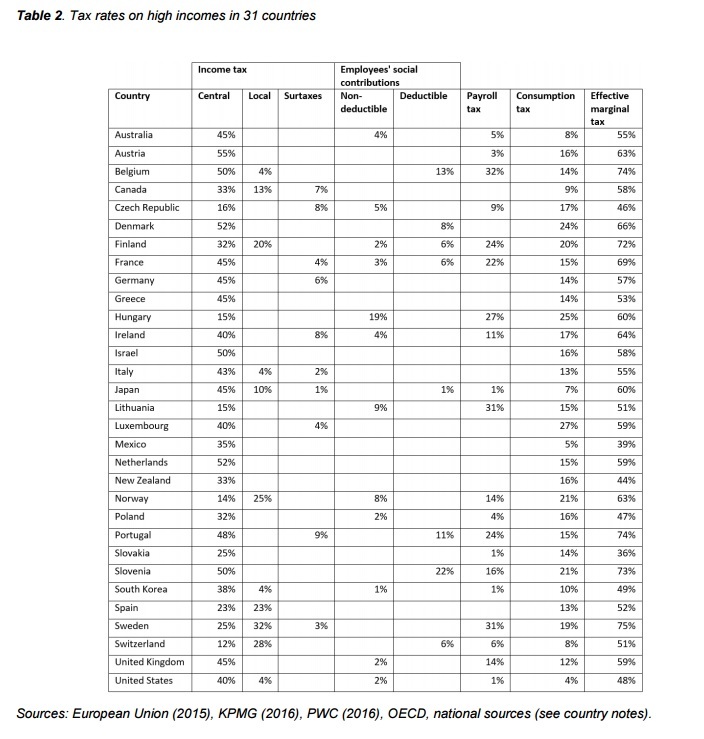 Our tax burden was (and still is) generally lower than Europe, but there’s nothing special about our quality of governance compared to other developed nations, and we definitely don’t allow privacy for our citizens (though we’re a good haven for foreigners). Pierre’s publication was so helpful that I’ve asked him several times to release an updated version. I don’t know if it’s because of my nagging, but the good news is that he’s in the final stages of putting together a new Tax Oppression Index. He just presented his findings at a conference in Panama. But before divulging the new rankings, I want to share this slide from Pierre’s presentation. 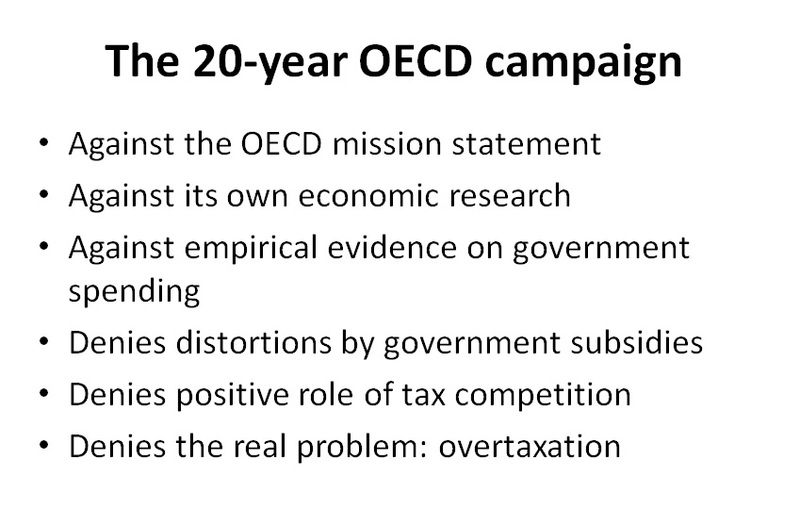 He correctly observes that the OECD’s statist agenda against tax competition is contrary to academic research in general, and also contrary to the Paris-based bureaucracy’s own research! Yet the political hacks who run the OECD are pushing bad policies because Europe’s uncompetitive governments want to prop up their decrepit welfare states. And what’s especially irksome is that the bureaucrats at the OECD get tax-free salaries while pushing for higher fiscal burdens elsewhere in the world. But I’m digressing. Let’s look at Pierre’s new rankings. As you can see, Switzerland is still at the top, though now it’s tied with Canada. Estonia (which wasn’t part of the OECD back in 2009) is in third place, and New Zealand and Sweden also get very high scores. 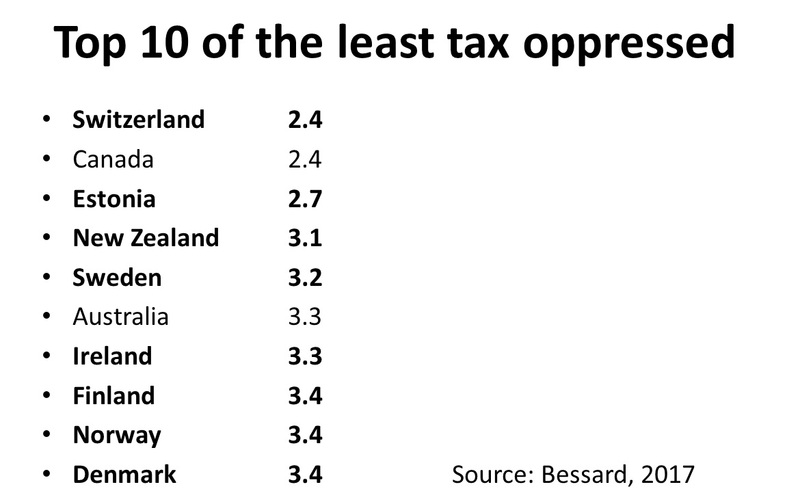 At the very bottom, with the most oppressive tax systems, are Greece and Mexico (gee, what a surprise), followed by Israel and Turkey. The good news, relatively speaking, is that the United States is tied with several other nations for 11th place with a score of 3.5. 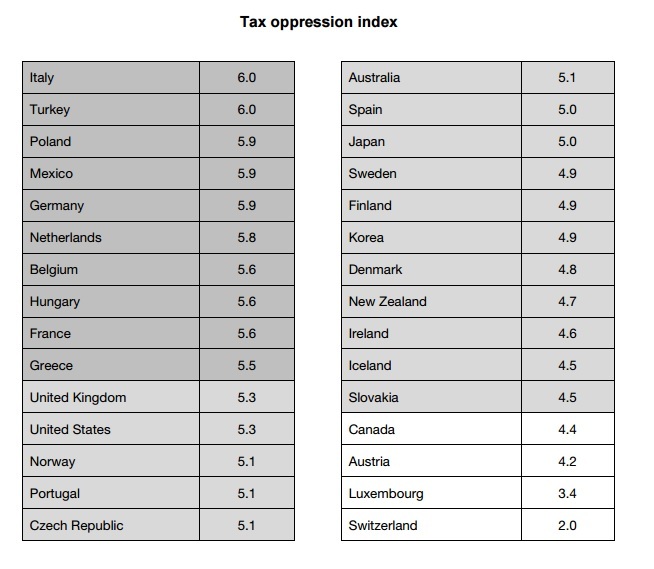 So instead of being in the bottom half, as was the case with the 2009 Tax Oppression Index, the U.S. is now in the top half. But that’s not because we’ve improved policy. It’s more because the OECD advocates of statism have been successful in destroying financial privacy in other nations. Even Switzerland’s human rights laws on privacy no longer protect foreign investors. As such, Pierre’s new index basically removes financial privacy as a variable and augments the quality of governance variable with additional data about property rights and the rule of law. P.S. When measuring the tax burden, the reason that America ranks above most European nations is not because they impose heavier taxes on rich people and businesses (indeed, the U.S. has a much higher corporate tax rate). Instead, we rank above Europe because they impose very heavy taxes on poor and middle-income taxpayers (mostly because of the value-added tax, which helps to explain why I am so unalterably opposed to that destructive levy). P.P.S. Also in 2009, Pierre Bessard authored a great defense of tax havens for the New York Times. 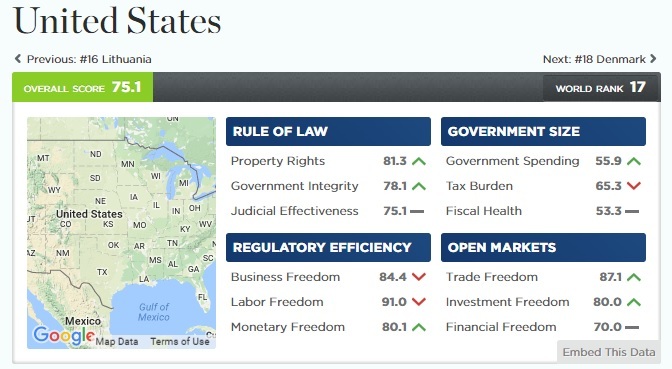 The Index of Economic Freedom is my favorite annual publication from the Heritage Foundation. It’s a rich source of information, using dozens of data sources, about economic liberty around the world. I first wrote about the Index back in 2010 and shared the bad news that the U.S. score dropped dramatically in Obama’s first year. Well, the new Index lets us see the net effect of Obama’s entire tenure. The worse news is that the U.S. score has dropped to 75.1 on a 0-100 scale. And the worst news is that this represents America’s lowest score in the twenty-plus years that the Index has been published. The United States is ranked #17 in the latest Index. We’re only in the “Mostly Free” category, behind Luxembourg and the Netherlands and tied with Denmark. The top-ranked jurisdiction, once again, is Hong Kong. 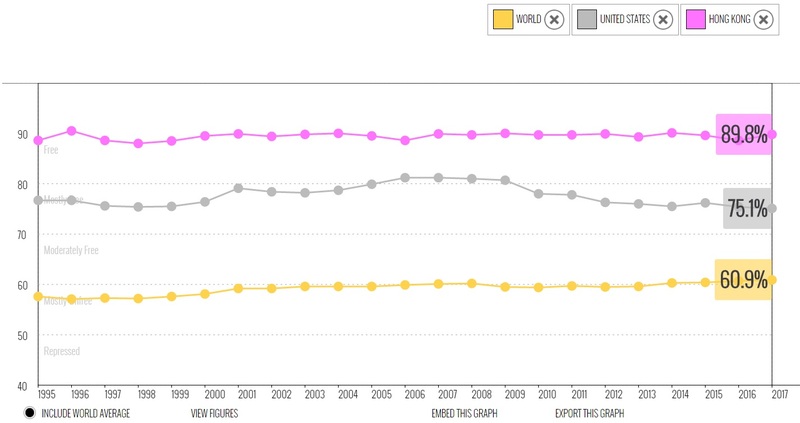 And what’s really amazing is that Hong Kong actually increased it score. 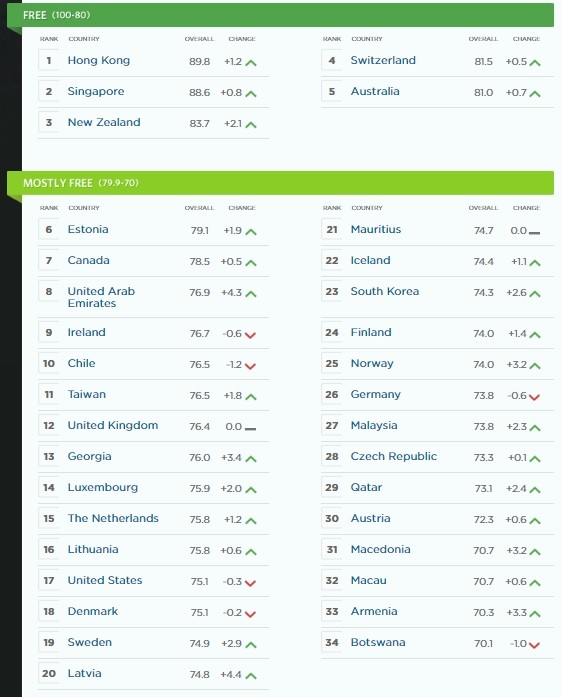 Indeed, all five nations in the “Free” category managed to increase overall economic freedom. So congratulations also to Singapore, New Zealand, Switzerland, and Australia. Here’s a map showing the entire world. The worst nations are in red, with North Korea at the very bottom, followed by Venezuela and Cuba. By the way, Cuba jumped 4.1 points last year, so maybe Fidel’s death is the beginning of some much-needed liberalization. For more information on the United States, here’s the breakdown of America’s score. As you can see, our worst category is “government size.” In other words, we tax too much and spend too much. America’s best score is for “regulatory efficiency,” which helps to explain why the U.S. gets a top-10 score from the World Bank’s Doing Business. Let’s close by comparing the United States with Hong Kong. This charts shows how our scores have changes over time, and also shows the average score for the entire world. The biggest takeaway is that the U.S. basically is halfway between Hong Kong and the world average. The great unknown, of course, is whether America’s score will go up or down under Trump.